The city has played a crucial role in UMA's founding: all aspects of the province (citizens, notable figures, and mass media) have been key drivers for the establishment of our University. It all began in 1968 with the development of the "University of Málaga's Friends Association" an organization that advocated for a University in the province by raising awareness on the issue and mobilizing citizens, which finally all led to its founding. This was soon followed further advancements in the founding process such as the development of the University College of Málaga, in 1971, and the grouping of the already existing Technical Engineering College, Teacher Training College, School of Economics and Business (then attached to the University of Granada), and the Seminary. Finally, in August 18th of 1972, the founding of the University of Málaga was approved by decree. The School of Economics and Business and the School of Medicine would be the first to be part of the institution we know today as the University of Málaga. With the aim of becoming a top-level full institution, UMA developed an expansion plan regarding fields of study and infrastructure. Thus, once established in El Ejido Campus, the University expanded towards Teatinos, an area that initially comprised the School of Medicine, the School of Humanities, and the School of Science, and gradually developed into a whole campus providing a full range of academic studies and services. In addition to expanding its insfrastructure, UMA also grew qualitatively; since the late 90s, a strong commitment to research and new technologies has been prevalent in its actions. In this sense, the University of M√°laga adopted a strategy to become an example for innovation and scientific development in of the south of Spain. Therefore, it developed an extensive partnership framework with Andalusia's Technology Park, increased the number of national and international research projects, and joined the Supercomputing Spanish Network in 2007 thanks to Supercomputer Picasso. 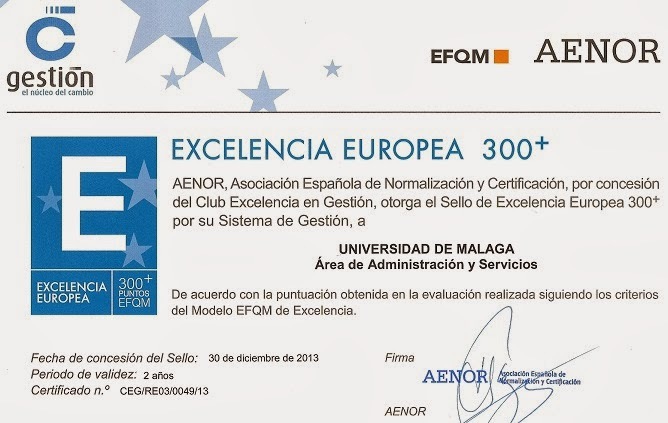 The academic and scientific progress, as well as the efforts made by researchers, students, teaching staff, and administrative staff led the University of Malaga (and the University of Seville) to be recognized as a Campus of International Excellence in 2012, under the name Andalucia Tech. At present, the University of Málaga remains highly committed to making scientific development and innovation the grounds on which social progress rests. The efforts made to promote mobility and attract international talent have stood out in the recent years, resulting in an open and cosmopolitan university involved in top-level research projects. 40 years after its founding, UMA has more than 35,000 students, 58 Bachelor's Programmes, 53 Master's Programmes, 278 research groups and 45 registered patents in 2011. Innovation, dynamism, and internationalization are the principles on which UMA's history is based, as well as its basis to overcome current difficulties and reinforce its duty to knowledge, society and the future. /cms/secciones/ajax/insertar_seccion/ /cms/secciones/ajax/borrar_seccion/ /cms/secciones/ajax/editar_seccion/ /cms/secciones/ajax/mover_seccion/ Are you sure you want to delete this section? 5576 You are about to cancel the edition. All your changes will be lost. Do you want to cancel and lost your changes?